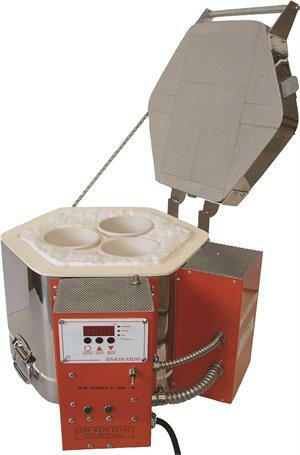 The Crucible 11 was designed to melt cullet in order to allow the hot glass artist to have various color pots available. Additionally, this kiln is perfect for roll-ups when you don't need a full furnace of glass. Max Temperature 2300F and Max Working Temperature 2150. Coils in crucible kilns tend to last 3 to 6 months and are not warranted. This kiln comes standard with the AF3P Orton digital 3-button controller, however you have the option to upgrade to the TAP preprogrammed digital controller. Important Note: Electric Crucible Kiln are designed to melt cullet and not to make glass from batch!!! Making batch usually causes the thermocoupler and the kiln brick to crystalize and deteriate quickly from the caustic fumes that are given off. Interior Dimension: 11" x 9"